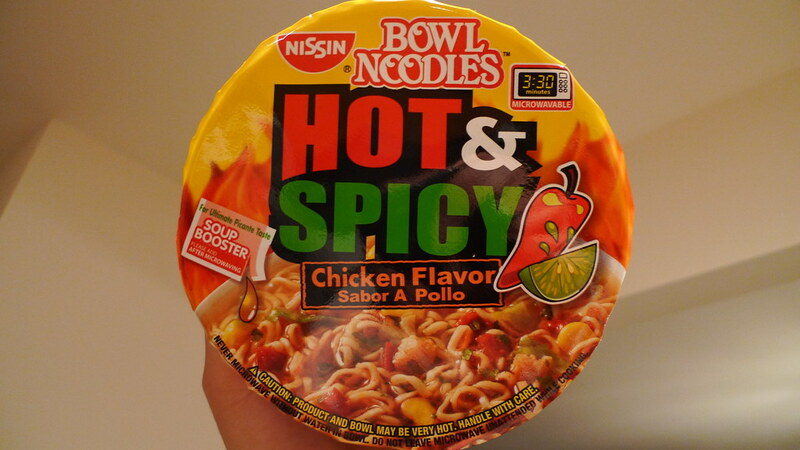 Nissin Bowl Noodles Hot & Spicy - Chicken. Since I've reviewed Nissin's Rich & Savory Bowl Noodles before, I figured I should review their Hot & Spicy line as well. Nissin's Bowl Noodles are made in the United States and aren't really available to the Asian market. I've complained about Nissin Foods USA making too many similar varieties of instant noodles, but maybe Hot & Spicy is different. Continue reading if you really want to find out. 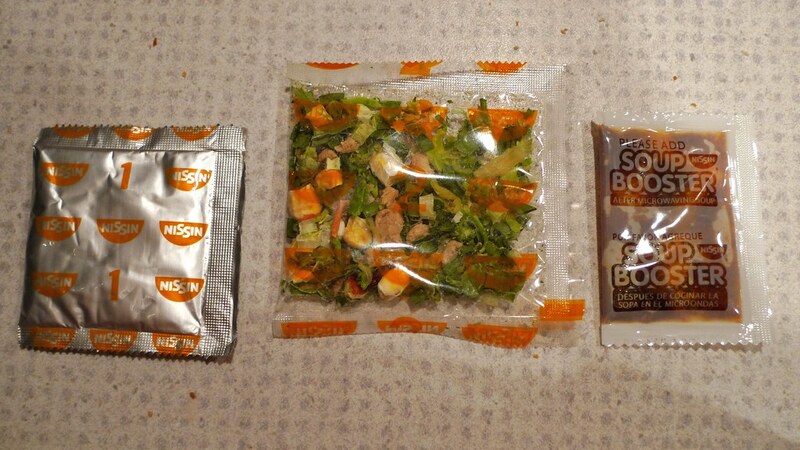 The three packets you get with Bowl Noodles - Hot & Spicy. Nissin Bowl Noodles Hot & Spicy comes with three packets that we are already familiar with in the Rich & Savory ones: seasoning, dried vegetables and chicken, and "Soup Booster". The seasoning is a deep red color that I can't help but wonder if they artificially made that so. 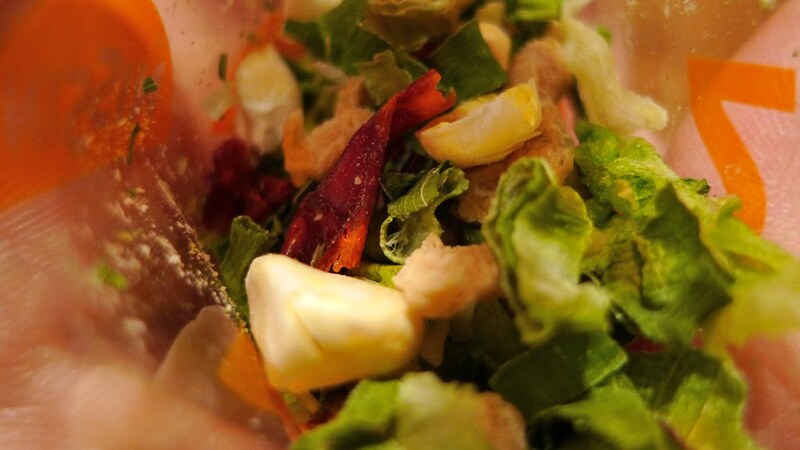 The dried veggies include green onion, corn, red pepper, as well as dried powdered chicken. Yes, you actually get some meat in this one. Always a big plus in my book. 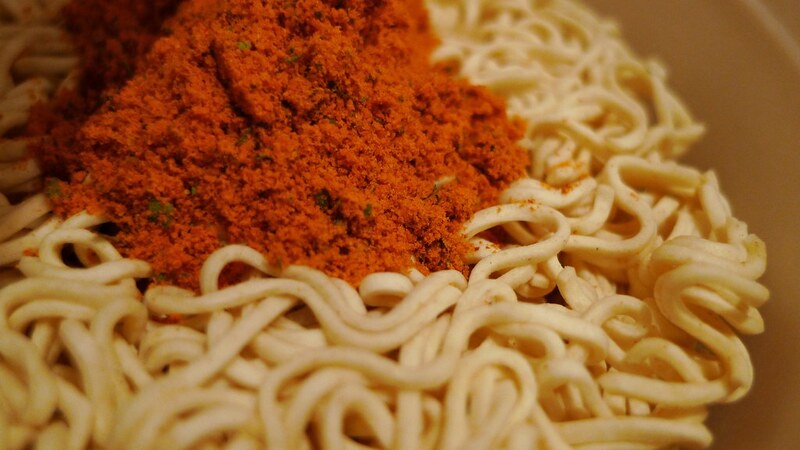 Seasonings sitting on top of the noodles before adding water. 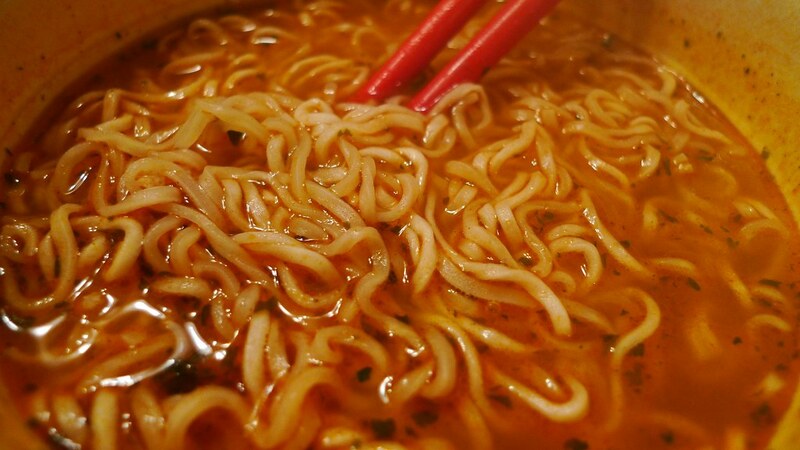 The noodles in Hot & Spicy are different from the noodles in Rich & Savory. These noodles are thinner and a bit more circular. No idea why they chose to use a different noodle. Nissin only provides microwaving instructions for Bowl Noodles, so that's how I cooked it once again. I still don't like how the noodles at the top don't really get cooked through enough. The noodles are tasty, but don't seem to absorb the broth enough. I had to drink the soup a lot to get the full experience. 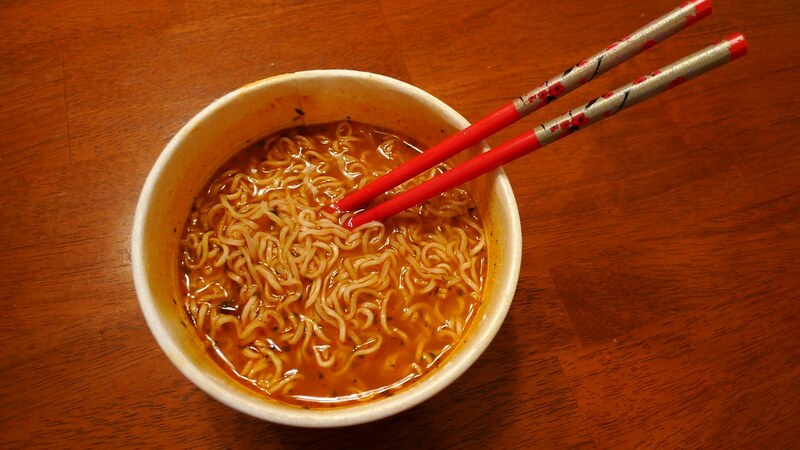 Ready to eat Nissin's Hot & Spicy Bowl Noodles. Speaking of the broth, it's interesting. It's good, but not great. Chicken flavor doesn't exactly jump out at me. I was surprised at how strong of a citrus flavor it had. There's a picture of a lime on the packaging, but I didn't think it would play such a prominent flavor. Sure enough, lime juice, citric acid, and lemongrass are three of the ingredients. I actually found the combination of the lime with the spiciness to be good. It's not too spicy though. Compared to Nong Shim's Bowl Noodle Soup, this is quite weak. Could definitely taste some garlic in there, too. Close look at the noodles and broth. As a rule, I don't let Juliana try spicy noodles, so we can't get her opinion on this one. I can't say that I would recommend this to just anyone. This one is very unique as I've never had anything else like it. A noodle beginner might want to start with something less flavorful, but an expert could really find this enjoyable. I'm so incredibly addicted to these bowl noodles...I just can not get enough. Awesome blog! I don't know what "soup booster" is but I was too afraid to add it. Very very good. I sprinkled Lawrey's salt only, and it is delicious. Delicious. I also add more stuff to mine when i have them. Before i microwave it, i add creole to give it that extra boost of spiciness, and i am the type of person that loves hot stuff and limes squeezed over everything lol. So after its done cooking, i add tapatio and lime juice to boost the flavor even more. With the booster packs, i try getting out as much of it as i can with a fork or something. Now i dont like the chicken or beef hot and spicy ones, but i love the shrimp one. Im not fond on the dehydrated shrimp itself, so i just throw that packet away. In the end, i never thought i could get it hot enough to satisfied my craving for spiciness, so now that the "nong shim" was mentioned to be spicier, i must try it! For anyone out there that loves the hotness, i suggest to try adding extras. Little at a time to start with so it doesnt get too over piwering for u.
I eat the beef version of these all the time. A few tips. First as soon as it's done in the microwave, add a lot of Sriracha and stir it in. After stirring, let it sit for at least five minutes. The noodles will soak up a lot of broth and taste even better! I am addicted to the chicken flavor! I, too, add extras to the soup... Frank's Red Hot, shredded rotisserie chicken, and diced green onion really make it delicious! I often add more water when making it and just add some chicken boullion if need to to keep the broth flavored. Great meal for under a buck...even with the extras! These are Fkn delicious but that sodium tho.. DAMN! The sodium content on this is wrong, unless Nissin has updated this product (posting this comment in 2019). I have an empty bowl of this sitting right in front of me on my desk, and the nutrition facts state 650mg of sodium with about 2 servings in a bowl. 1300 is still high, but nowhere near the 1920mg that you stated. The lid also says "NO MSG ADDED", although there are MSG substitutes in here which still help the product retain its savory quality. I add frozen vegetables and boiling water, and then microwave it for another minute. Nice and hot with soft noodles.